As we look forward to the new year, we want to stop and remember the great books that were released in 2015. What follows is the first in a series of five “Best Comics of 2015” posts we’ll be posting through January 6. Starting January 7, you’ll have the opportunity to weigh in and help us crown the Best Comic of 2015! Known for publishing licensed books such as Buffy the Vampire Slayer, Conan, Predator, and Tomb Raider, Dark Horse Comics also has a strong commitment to creator-owned series. Series like Colder, Usagi Yojimbo, Hellboy, ElfQuest hit the shelves month in and month out. If you see the horse on the cover, you’re going to get a great comic! I know that I’m about to break the first rule of Fight Club, but I think the sequel warrants a little leeway, don’t you? In the 10 years that we’ve waited for Chuck Palahniuk to invite us to Fight Club again, we’ve been hoping that Marla and the novel’s protagonist were free of Durden and were left to settle in to normal lives. It seems as if others–even Marla herself–have other plans. 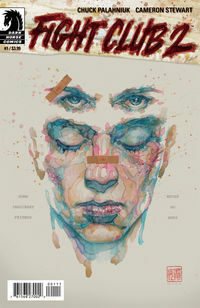 Throwing us right back into the ring, Palahniuk delivers Fight Club 2, a story that is equally compelling to fans of the book and the movie. Palahniuk teams with Eisner-award winner Cameron Stewart to take us for a full-on beat down, and I’ve loved every minute of it. One thing that really stood out to me from the first issue was Chuck Palahniuk and Cameron Stewart’s panel design. From the first page you get this feeling that this isn’t Chuck’s first time writing for comics. Cameron Stewart flexes his artistic muscle, resulting in art that will forever take over when I re-read the novel. And I’m completely ok with that. What happens to your keys or that matching sock when you lose them? The short answer is that they’re in The Meld. Here’s the long answer. 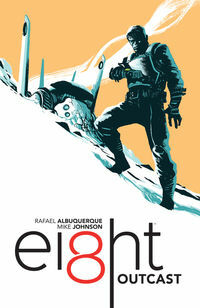 Rafael Albuquerque and Mike Johnson’s five-issue miniseries, ei8ht takes us on a journey to a place that exists outside of time. Past, present, and future meet in a story that draws you in and keeps you hooked right up until the end. The team expertly uses color to help the reader know when we are, with the past in green, present in purple, and future in blue. The resulting effect is that a seemingly disjointed story comes together in a way we haven’t seen before. 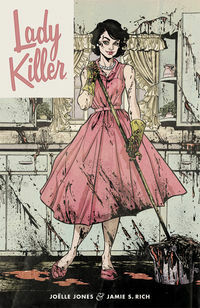 Co-written by Jamie S. Rich and Joëlle Jones, Lady Killer is a tour de force unlike anything modern day comics has seen in a very long time. Many people liken the series to Hannibal, Silence of the Lambs or Dexter, but really, Lady Killer is in a league all its own. The series takes the classic idea of the American housewife and turns it, rather violently, on its blood-soaked ear from the get go. The strength of the story’s main character, Josie Schuller, hits on the struggle to take back what was once “yours.” To find a place that you can come to in your life where you have to work as hard as you possibly can to make a bad thing right. If there is any analogy that I can take away from this story, it’s that you can take control of your life. And Josie is a strong character that will take her life back, screaming, bloody and impaled, but at the end, her life will be hers. A book that will make your skin crawl, literally. 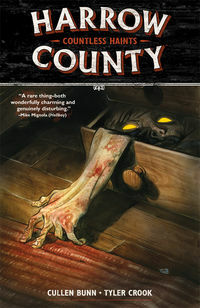 Witten by the prolific Cullen Bunn (the busiest man in comics), Harrow County is a creepy little piece of Southern Gothic storytelling. The story centers on a young girl named Emmy, around her 18th birthday she begins to get visions and exhibit strange powers. Is she an instrument of good or evil is the question that forms the spine of this delightfully unsettling horror book. 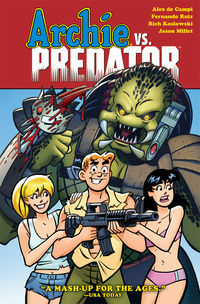 Archie’s no stranger to being prey—after all, Betty and Veronica have been pursuing him for more than 70 years! But what happens when he’s up against the universe’s most terrifying hunters? Dark Horse and Archie Comics teamed up this year to bring us Archie vs. Predator by Alex de Campi (Grindhouse, No Mercy), Fernando Ruiz (Archie: The Married Life), and Rich Koslowski (Three Fingers), delivering equal measures of gore and humor, and making it one of my favorite miniseries of 2015! Archie vs. Predator starts out like any ordinary tale from Riverdale: Jughead wins a luxury beach vacation and brings the whole gang out for spring break. A popularity contest and a confrontation between Betty and Veronica ensues. However, when things quickly escalate, a vengeful Betty accidentally attracts the attention of a Predator, who follows them home. Ridiculously violent hijinks ensue. Stay tuned to the TFAW Blog in the coming days as we’ll be posting four more Best Comics of 2015 lists. At the end, YOU will decide which one will be crowned as the Best Comic of 2015!